About By Myself “By Myself” was written for the 1937 musical Between the Devil, where it was introduced by Jack Buchanan. 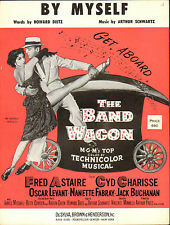 Another great Schwartz-Dietz song from Between the Devil was “I See Your Face Before Me.” This song was used in the 1953 Fred Astaire film, The Band Wagon. Why try to lose me? So near yet so far? By Myself was recorded on November 3, 1958 and was released in 1959 on the album Hometown, My Town. It was arranged by Ralph Burns. “By Myself” was recorded in July 1993 and was released that year on Steppin’ Out. It was arranged by Tony Bennett and Ralph Sharon.